I present to you: a bag of glucose. None of that mamby-pamby table sugar here, this is the pure stuff: bane of diabetics and enricher of their doctors, this is pure dextrose, or grape sugar as the bag says. I found this in a regular supermarket, in the baking aisle as I recall. This 150g bag will set you back a little over $3. Let’s make our own Pixy Stix! Here’s another “Hey, that’s a good idea” moment. Convenience stores in Japan often sell small buckets already filled with ice, as well as individual plastic cups filled with ice (including lids and straws, if you look carefully). Have you ever seen a dessert sandwich? Here’s a sandwich made of a cinnamon danish bun with fruit, chocolate, and whipped cream filling. Call me crazy, but even if you love desserts made with fruit and cinnamon, when packaged like this these sandwiches do not look appealing in the least. 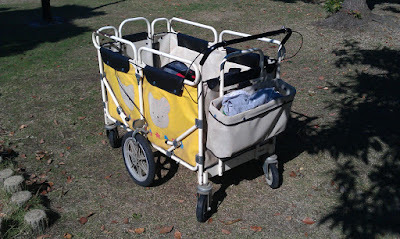 What do you do if you run a preschool and you want to take your charges out to the park? Why, you pile them in one of these, of course. Our school doesn’t use them because we don’t take kids to the park until they can walk properly on their own, but I seem to recall seeing them pretty full with about eight kids in there at a time. 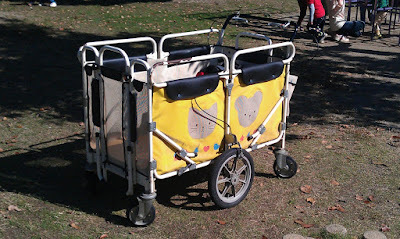 If you look closely, you can see there are separate bicycle hand brakes for each of the large wheels on the sides, and the four small wheels are just swiveling casters. It also looks like the center piece opposite the handles opens up to let kids in and out, but I’ve only seen kids lifted in and out, so I don’t know for sure. I took these two pictures last week at the park near MSP, when another local preschool brought a large group of kids at the same time our bilingual classes were there. I don’t really know for sure, but if I had to I’d guess that preschools in the US don’t take their kids off premesis at all. What do you think about these things? Here’s a neat idea that may have you wondering why no one thought of it before: a small fire extinguisher in an aerosol can, for those small, not-yet-out-of-control fires. Seriously, why did no one think of this before? This being Halloween, I thought I’d share with you a video of the setup for my school’s annual Halloween party. You can see the size of the hall we use and get an idea of how we entertain 100 of our students for two and a half hours. This is a photo of the instructions posted on the inside of a sliding restroom stall door in the Takamatsu airport. Believe it or not, the (not-pictured Step 2 of the) instructions were actually useful because the lock was like some sort of logic puzzle where you have to figure out the exact direction and angle at which two pieces of metal engage and disengage. While conceptually a good idea to save space in those tiny airport restrooms (when was the last time you saw a stall as big as the one in the diagram? ), this door proved more novelty than useful. This pair of courtesy phones (look closely for the other cord hanging down on the other side of the glass) is at the Takamatsu airport, on the glass wall separating the pre-security check-in area and the post-security boarding gate area. It’s basically a prison phone so you can talk to people on the other side without having to deal with going out of and back into the secure area. I took this photo at an airport Pizza Hut in Guam that is frequented by throngs of Japanese tourists. 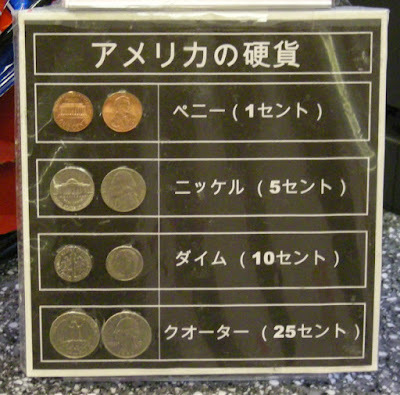 The names of the coins are on the left, and the values are printed on the right. Here is the 海苔 – のり – nori (shredded and formed seaweed) shelf in a local supermarket. In this photo alone, you can see over a dozen varieties, and you can tell the shelf is in need of restocking. Japanese people eat a lot of seaweed, let me tell you. I can also tell you the names of the kinds I don’t like, and ways to prepare it that taste like slimy, salty rubber. Who just updated their blog?